"catalogue consisting of names in a row or series," 1602, from M.E. liste "border, edging, stripe" (c.1280), from O.Fr. liste "border, band, row, group," also "strip of paper," or from O.It. lista "border, strip of paper, list," both from a Gmc. source (cf. O.H.G. lista "strip, border, list," O.N. lista "border, selvage," O.E. liste "border"), from P.Gmc. *liston, from PIE *leizd- "border, band." The sense of "enumeration" is from strips of paper used as a sort of catalogue. The O.E. word survives in archaic lists "place of combat," at the boundary of fields. Boundary, border, place...the language is oddly fitting. Lists help us to locate ourselves. 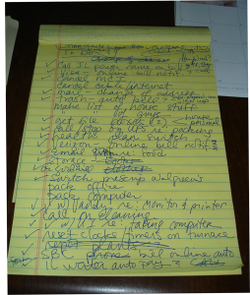 No surprise, then, that as I make the sabbatical transition, my life is dominated by lists. If you look at the list above, you'll even see that one of the items on it instructs me to make another list. But...combat? Yes, in a way, maybe that too. Oooh, we gotta get Spencer over here: he analyzes list-making habits. For example, I notice a proliferation of question marks that shows you are thinking beyond the list, as in, "how in the hell will THAT [name on electric bill, etc.] be resolved?" I also see that the handwriting gets wilder and bigger. That is SOME list! my favorite action item on this list (8 down from the top): "Make list of guys"
Ha, yes, listmaking habits indeed! For the record (and in case My Beloved is reading this), "guys" refers to the people who typically work on my house -- plumbers, landscapers, AWOL electricians, and the like. The people you call when the household crap hits the fan, as it were. And some of the guys are even women. And please note that many things on this list are checked off. This makes me feel accomplished. And balances out the question marks, no? It means I decided in the larger scheme of things that maybe that's not worth it. Though I have another list on the whiteboard on my fridge and it's still on that, not crossed out. Oh, my, so many lists!